Roman Alvarado and Randolph Sandoval. 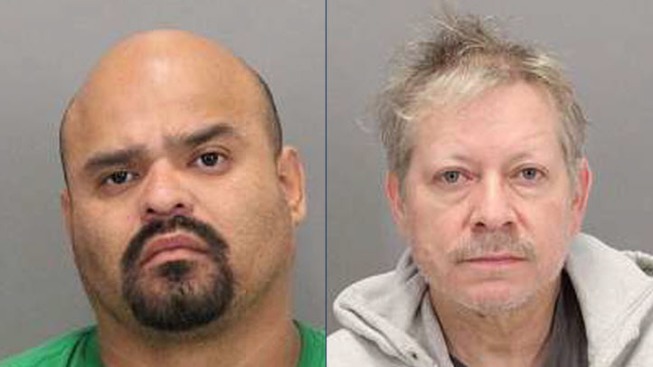 Two men have been arrested in connection with the death of a transient stabbed in North San Jose last month, police said Monday. San Jose residents Randolph Sandoval, 53, and Roman Alvarado, 40, are suspects in the death of Jeffrey Cooper, 55, whose body was found Oct. 10 around 10:30 p.m., police said. Officers had responded to the 700 block of Ridder Park Drive near a Lowe's Home Improvement store east of Interstate 880, where they found Cooper unconscious and injured, according to police. The victim was pronounced dead at the scene. An autopsy from the Santa Clara County medical examiner's office showed he suffered at least one stab wound, police said. Detectives following up on the case identified Sandoval and Alvarado as the suspects. They were arrested Wednesday in San Jose and booked into Santa Clara County Jail, according to police. Anyone with information on the case is asked to call police Detective Sgt. John Barg, Detective Wayne Smith or Detective Brian McDonald at (408) 277-5283. Those who wish to remain anonymous can call Silicon Valley Crime Stoppers at (408) 947-7867.